I look up and see that my being 19 in 1984 makes me middle-aged going-on old. 1984 is the new 1954. If I just now had read the sentence, “In 1954 I was 19 years old,” I would think, “Wow. That guy is old! He must be at least 40 something by now!” It’s so hard to accept that it’s 2013. Okay. Let’s begin again with the ADHD turned down just a tad. In 1984 I flunked out of IU and had no idea what I wanted to do with myself. I knew I wanted to give college another try but I also knew that when the time came, I’d better be ready to give it my all and have a plan of action. I got a job at a Wendy’s in Southern Indiana and worked there all of 8 weeks. I figured when I got used to smelling like beef fat all the time it was time to look for something else. At 19, the idea that perhaps I’d better find a new job before quitting my current one didn’t hit home. So I moved in with my favorite cousin, Karen, and leeched off her and her husband for a while. Well, I suppose it was symbiotic rather than parasitic. But we became good friends (especially after getting over having a nasty fight which resulted in my moving out) and she taught me to crochet. I’d always been fascinated at the idea of taking some string and a stick or two and making clothing. It seemed like magic and I assumed it would take ten days just to see anything other than a chain of knots emerge. Karen taught me how to make the ubiquitous Granny Square and then sew them together into an afghan. A short time later I just started crocheting around my finger and ended up doing it to all four main fingers before joining them and finding myself crocheting a glove just by using what she’d taught me. I didn’t have a pattern and wouldn’t have known how to read one if I did. I was just having a blast. As the years went by I did learn to read patterns and made doilies as well as stuffed animals. Back then, we didn’t have any funny Japanese names for these things. They were toys. Dolls. Animals. I made many afghans and crocheted baby blankets for both of my sisters for their first born. (To be shared by second born, etc.) I even got ambitious and started a crocheted bedspread made from “crochet cotton.” One giant doily for the bed. Woohoo! I fished it out of storage recently and was surprised that I had completed two and a half rows of it lengthwise. I did a lot more on it than I’d remembered. Eventually after going back to school for a theatre degree and then giving myself academic whiplash by turning a quick 180 degrees and switching to pharmacy, I graduated from Purdue University in 1993 with a BS in pharmacy. I had time to crochet again and took it up from time to time. I had a few unfinished items along with experiments that didn’t go well but I was having fun. In 2001 I found myself living in Jeffersonville, Indiana after a stint in Seattle, Washington with Walgreens and I was finally a home owner. It was time to start crocheting some afghans! I’m not usually a fan of big-box stores but I didn’t know where else to go for yarn. I bought some cheap acrylic like a lot of crocheters but noticed that the quality in the new century had greatly improved. I was beginning to get curious about yarn. 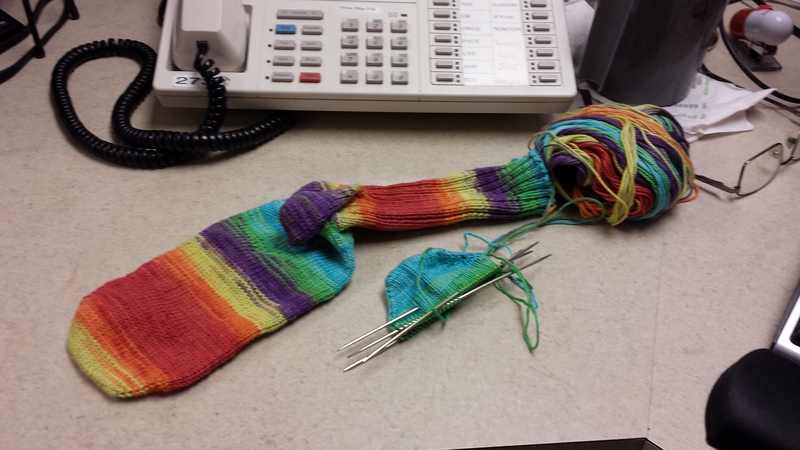 To me, it had always just been that colorful thickish string that I used for afghans, toys, and the occasional misshapen sweater. I had no idea it came in different weights and I thought “worsted” was some kind of jacket. I began my detour into a new land at the tender young age of 44 when that big-box store in Jeffersonville stopped selling yarn in 2009. No yarn in Jeffersonville. Did I really have to go to the OTHER big-box store over in Clarksville? The one that starts with a W and ends with most of its employees having to scrounge for health insurance? Well that’s just what I did at first. Then one day I typed “yarn Jeffersonville Indiana” into some unknown web search site that rhymes with “moogle” and saw two words pop up that I never expected to see together. Grinny Possum. What the heck is a Grinny Possum? Why is it capitalized? Wait. . . yarn store? A store that sells yarn? For real? Who’d be crazy enough to open a store that sells yarn? Visions of Red Heart (no offense, I do like that yarn) and Lion Brand acrylic (ditto!) went round and round in my head. Who’d open a store just to sell that? How could they compete with the big boxes? LYS. Local Yarn Store. Oh, it’s a phrase that warms the heart now that I’ve “become.” But at the time it just sounded silly. I had to check this place out. I went to the website and was instantly amazed. It seemed like it wasn’t just a store, it was a kind of club too. The more I read the more I realized it was almost like a church where the religion is making stuff from yarn. Okay, perhaps not so much a religion as a nice big family. I have to admit that at first I was a little intimidated. Would I measure up to these people? They seemed to be focused on knitting and while I’d always had a secret wish to learn to knit, I was steadfastly loyal to the art of crochet. I’d just have to go to the shop and see for myself. Okay, once I look at the Grinny Possum website four or five more times and put it off a bit, I’m going right downtown and check this place out!